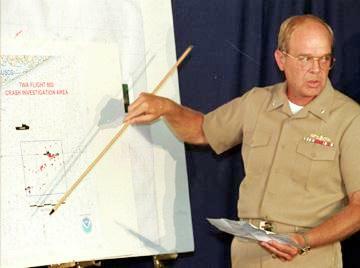 Navy Rear Adm. Edward Kristensen described where U.S. ships and aircraft were on July 17, the day TWA Flight 800 fell into the Atlantic Ocean off New York's Long Island. Rear Admiral Edward K. Kristensen is the son of Mr. and Mrs. R. A. Kristensen of Frankfort, Ind. He graduated from the United States Naval Academy with a Bachelor of Science degree and was commissioned 9 June 1965. Rear Adm. Kristensen has served at sea in USS Norfolk (DL 1), USS Wilkinson (DL 5), USS England (CG 22), and has commanded USS Waddell (DDG 24) and USS Lake Champlain (CG 57). He has also served on the staff of Destroyer Squadron Twenty-four and as the Assistant Operations for Commander Seventh Fleet. Shore assignments have included the Bureau of Naval Personnel, the Office of the Chief of Naval Operations, Deputy Commandant of Midshipmen at the Naval Academy, and Commander United States Naval Forces Marianas. Rear Adm. Kristensen received a Master of Science degree in Computer Systems Technology from the Navy Post Graduate School in Monterey, Ca., and also graduated from the National Defense University at Fort Leslie J. McNair in Washington, D.C.
Rear Adm. Kristensen's awards include the 1983 James Bond Stockdale Award for outstanding leadership, the Defense Superior Service Medal, the Legion of Merit, the Meritorious Service Medal (with two gold stars in lieu of the second and third awards), the Navy Commendation Medal, the Navy-Marine Corps Expeditionary Service Medal, the Humanitarian Service Medal, and various unit and campaign ribbons. Rear Adm. Kristensen is married to the former Suzanne C. "Sam" Samsel of Washington, D.C. They have one son, Erik, who is currently serving in USS Chandler (DDG 996).